Hotel Las Anclas, 325 south 5th Avenue, ☎ (52) 9 87 8725476. checkin: 132:00; checkout: 12:00. Offers spacious suites in a serene tropical garden. 80-120 USD. Beachouse Hostel Cozumel, Lote 36, Cozumel (Country Club Estate, Zone North), ☎ +52 1 987 872 62 85 (beachousecozumel@gmail.com). 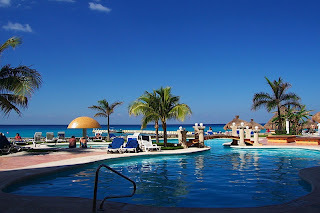 The Beach House Cozumel is mixed in a warm, traditional Mexican style with European quality and a few personal touches. You can also enjoy our private swimming pool and the beautiful garden. Just a few steps away is our fantastic white sand beach, which offers some of the best kite boarding conditions in Mexico. The Beachouse organize Diving-,Snorkel- and Fishing Tours. 25 - 55 USD. El Cid La Ceiba Beach Hotel, Carretera A Chankanaab Km 4.5,, ☎ 011-52 (987) 872-0844. 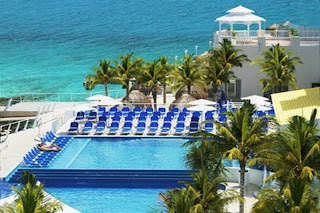 A member of El Cid Resorts, this beachfront hotel on the southern shores of Cozumel Island features private balconies, all inclusive plans, ocean view swimming pools, an oceanfront restaurant,and snorkel and shore diving. Hotel Flamingo, Calle 6 Norte. Simple but comfortable rooms, available for very affordable package rates through many common travel booking sites. The daily included breakfast is high-quality and a welcome bonus. This is a small business so some minor imperfections may need to be tolerated (e.g., sometimes the water heater needs to be restarted), but the staff is quick to help whenever possible. Occidental Allegro Resort, Kilómetro 17.5, Carretera Sur, ☎ +52 (987) 872 9730. A five star resort located on the beach offering all-inclusive packages. 3 on-site restaurants, still included in your stay, a snack bar equipped with a buffet for lunch and late-night snacks. They also have a swim-up bar, direct access to the beach and docks for any snorkeling or scuba diving. From $68 p.p. The Summer Place Inn, Av. 10 (between 17 and 19), ☎ +52 (987) 872-6300 (info@cozumelinn.com). Private units and a condo which can be booked nightly, weekly or monthly, run by a Canadian family. You can also call in Cozumel on +52-987-872-6300 or in Canada/US on 604-755 4539. Villa Anna Maria, 65 bis Av. 171 (between 1 y Rosado Salas,), ☎ +52 (987) 869-1925. (info@mayaroute.org). Bed and breakfast place run by a Scotsman and a Mexican. Villas El Encanto, Calle 21 sur No.44 entre Av.Rafael E Melgar y Av 5, Col. Andres Quintana, ☎ (987) 869 0008. This hotel offers cozy and well-appointed rooms, all of which have air-conditioning, cable TV, and Internet access. Some of its amenities include swimming pool, spa services, and assistance for yoga sessions, scuba diving, snorkeling, fishing trips, sea treks, golf, shopping. rates start at USD 50. Villablanca Garden Beach Hotel, Costera Sur Km 3 (3km south of town), ☎ +52 (987) 872 0730 (info@villablanca.net). Located outside of town, this hotel is adjacent to three SCUBA shops (Dive Paradise, Scuba Mau, Papa Hogs), making it a good option for divers. Hotel amenities include a pool, tennis courts, restaurant, free (albeit slow) wireless internet in the lobby, air-conditioning, and an appointment-only spa/gym. $50-$150 per night. Villas Deja Blue, Calle 21 Sur esq. 5av #101, ☎ +52 (987) 872 4883. Villas Deja Blue provides twin, queen, king, double, deluxe and villa deja blue villas with central air-conditioning, cable TV and wireless DSL internet access. Its facilities and services include salt-water pool, pool deck, scuba diving arrangements and housekeeping services. Casa Colonial (Mexican Colonial Architecture), Ave. 35 Entre 8 Y 10, ☎ US/CA 1-866-437-1320. Casa Colonial; Cozumel vacation rentals in the heart of San Miguel, Cozumel Mexico. These vacation villas represent Luxury without the price tag. El Cid La Ceiba Beach, Carretera a Chankanaab KM 4.5, ☎ +52-987-872-0844. 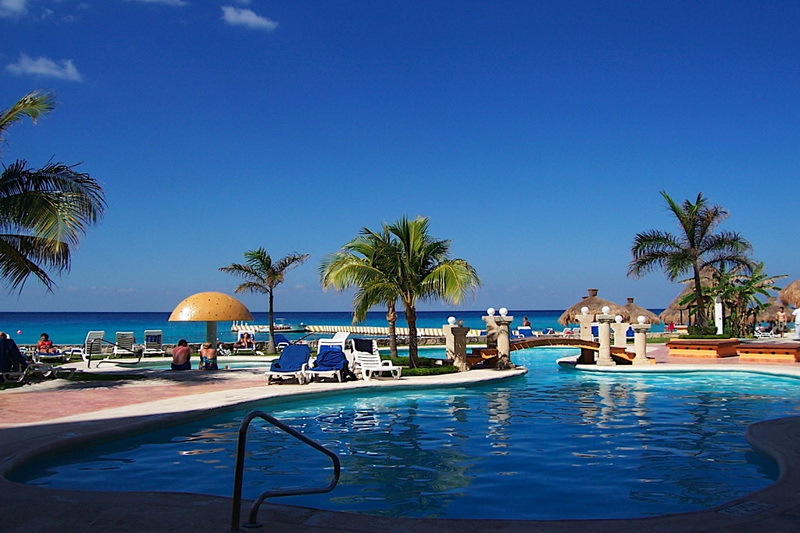 A Cozumel resort on the beach located on the southern shoreline. This oceanfront hotel features newly renovated accommodations, El Cocay Spa, a brand-new eco-park and a private dive center. ADR: $81.